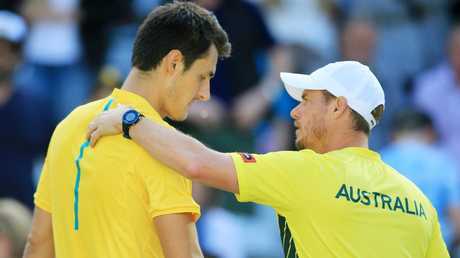 BERNARD Tomic will never play Davis Cup under Lleyton Hewitt after the team captain said that blackmail and physical threats had left their relationship irreparable. 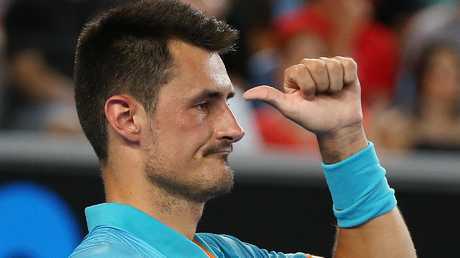 Hewitt declared that Tomic's comments attacking his captaincy were "what we've come to expect from Bernie", who he labelled a "clown" and said he did not want anything to do with the explosive 26-year-old. The former world No. 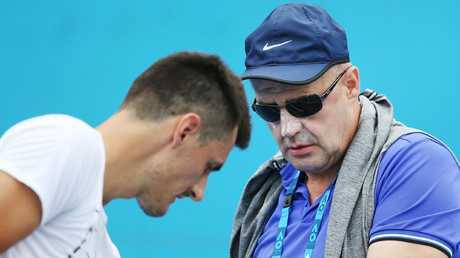 1 said that Tomic had attempted to blackmail him in relation to Davis Cup and wildcards which proved the final straw. "I think the threats that I've received for me and my family that I've had for a year and a half now … I don't think anyone would reach out to a person that speaks like that," Hewitt said. 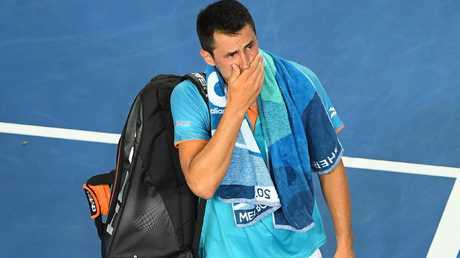 Hewitt said the threats from Tomic had been physical and to his family. "Just close-knit family. But I still have those," he said. "No (I don't feel threatened by them). Yep (I consider them empty threats)." He said while he had received them for about 18 months, he had not received any recently. "I don't think he's got my number," he said. 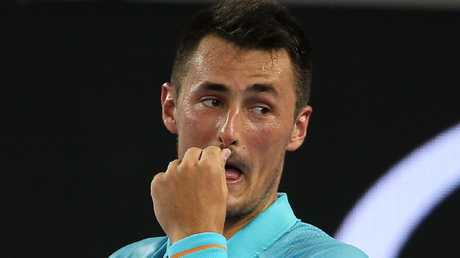 Hewitt - who flatly rejected Tomic's suggestion that some Australian players had been afforded preferential treatment with wildcards - said he was determined to "set cultural standards" in the Australian Davis Cup team. When asked why he thought Tomic behaved the way he did, Hewitt said he was unsure but suggested it was "maybe his upbringing". "I don't know what's happened - why Bernie is Bernie," he said. "I have no idea. It's probably his upbringing, I'd say, has a big part to do with it. "For me, it's been more disappointing that probably the first two years that I was in this role … I've been in it a bit over three, but the first two were pretty much Bernie and Nick were my two priorities. For Bernie to come out and have a go - but more to get all his facts wrong - that's probably the most disappointing thing. "For me, the biggest frustration is I feel like I really went out of my way to help Bernie, especially when I first came into the role. "I've spent a lot of time with him one-on-one at a lot of tournaments, tried to get a coaching structure and physical team around him to give him the best opportunity and at the end of the day, he still kept making the wrong mistakes. "For me, it was probably the abuse that I copped from him that in the end I drew a line in the sand and I haven't spoken to him since. "It will (continue). He won't play Davis Cup while I have anything to do with it." Hewitt said the door remained open for Nick Kyrgios, who he admitted he had spoken to in the wake of the young star's social media rant on Wednesday night. "We feel like we have a responsibility to set a cultural standard and right now Nick's not meeting those either," he said. "The things that we feel like we have to push … all we ask for is commit to the sport. Go out there and give 100 per cent every time you step on the court." 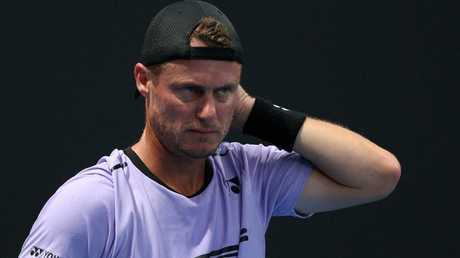 Hewitt said he was disappointed that the saga had overshadowed the efforts of emerging young stars at the Australian Open such as Alex de Minaur, Alex Bolt and Alexei Popyrin. "It makes me disappointed, the biggest thing. Because deep down, Bernie knows what I've done for him and how much time I've spent. You know, I've flown up to the Gold Coast to try and put teams around him when he was struggling mentally with certain issues as well with his family situation at times. "For me, it's been more disappointing that probably the first two years that I was in this role … I've been in it a bit over three, but the first two were pretty much Bernie and Nick were my two priorities. For Bernie to come out and have a go - but more to get all his facts wrong - that's probably the most disappointing thing." "Absolutely. 100 per cent. I've spoken to Nick, and we continue to speak. Nick and I have had a great relationship, but I think there's still … standards have to be set, and the role that I'm in now, you have to have standards. We see it in all different sports as well and all I want guys to do is commit to the sport and work hard and want to play for Australia. I don't think that's too much to ask." "That's one of the standards, absolutely. That we can't put up with. Just for our culture of Australian tennis moving forward. Can't do it. I don't think it's a good look. I've spoken to Nick about it and he understands that. Whether he learns from it, that's another thing." "I think the threats that I've received for me and my family that I've had for a year and a half now … I don't think anyone would reach out to a person that speaks like that. "It started because of blackmails to do with wildcards. This was over a year ago. Yeah (they've stopped). I don't think he's got my number anymore, hopefully." "Blackmail, threats, and physical, yeah. "(They were also to) family. Just close-knit family. But I still have those. "No (I don't feel threatened by them). Yep (I consider them empty threats). Q: What did he try and blackmail you with? "It was all to do with Davis Cup to not play." "When I was working with Bernie, the biggest thing I probably saw with him was he didn't work hard enough. So I realised pretty soon that if he didn't pick up his game fitness-wise, his game style - he didn't have as big a weapons as Nick to finish points off when he needed to. He was going to have to seriously commit, but he was so far down the line from not training, though, that it was going to take four or five preseasons and years for him to even get close to Murray, Djokovic, these guys. That's why he's got very little chance of going deep in majors." "I don't have a management company. No (I'm not getting any percentage)." "I don't think (there's something broken). Not that I know of. I don't know what's happened - why Bernie is Bernie. I have no idea. It's probably his upbringing, I'd say, has a big part to do with that. As I said, Nick, I feel, still has a lot to learn, absolutely. "Things have happened (with other players). I don't have an answer. But then I look at Alex de Minaur, Alexei Popyrin, Alex Bolt, John Millman and what he did at the US Open. For me, the most disappointing thing is on Day 1, we had these great wins by a lot of our guys and all this Bernie comments overshadows it. It's one clown making a silly comment and that's the main news. I just feel like we should be talking about that we've got some exceptional players doing exceptional things here and they get one, two weeks a year to shine on home soil. I don't really want to take the limelight away from them." "I think it's unbelievable that those two got an opportunity and have taken full advantage of it. I'm not surprised. The biggest thing is, and what we want to get back to … is one thing you control is how hard you work. And those guys have worked their butts off this preseason. All of them. Throw John Millman in that category. Jordan Thompson's had a great summer. They've had massive preseasons. There's no secret. Fifty per cent of tennis is going out there and doing the work. For Alex to be able to do what he did tonight, that comes back to the work he's done with Tom Couch and the performance team here in Melbourne throughout November December. For me, it's satisfying seeing those guys get results. And that's a first time for Bolty being on the big stage. To last five sets against a seasoned campaigner like Simon is something to tip your hat to." "Possibly. I don't know. I still enjoy playing some doubles sometimes on the tour. For me, I've enjoyed playing with some of the younger Aussie guys. It gives me an opportunity to see them first-hand, as well - how they handle pressure in different situations. It certainly helped with dealing with the guys on the Davis Cup call when I'm out there with them on the sideline. I don't know, right now. Sorry."